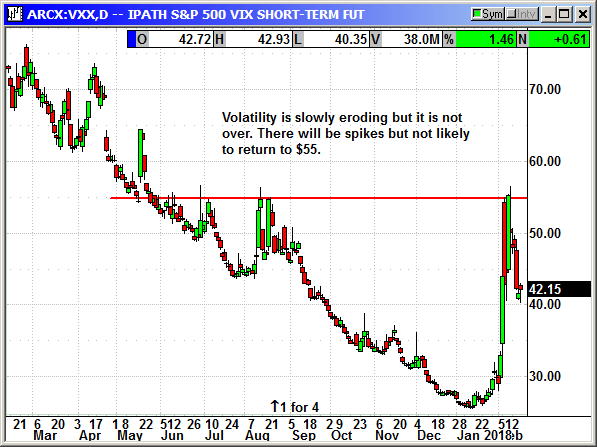 Volatility has declined but it is still with us and should remain for another 3-4 weeks. It normally takes 4-5 weeks after a market event for volatility to return to normal. Sometimes it takes longer. That does not mean the market cannot continue higher. The volatility this weekend has already been extreme. On Sunday night, the S&P futures rose +13 and on Monday night, they have been down -11. The Chinese markets are closed and that could be adding some uncertainty. 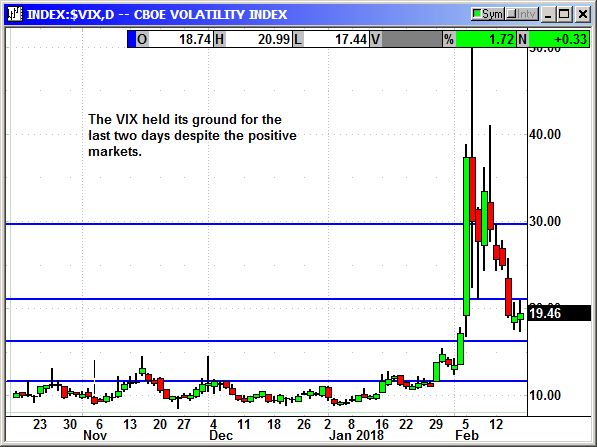 The VIX has held at about 19.50 for three days even while the market was moving higher. That suggests investors were still worried about the future and were buying puts for protection. The VIX is calculated off put prices on the S&P 30 days out. 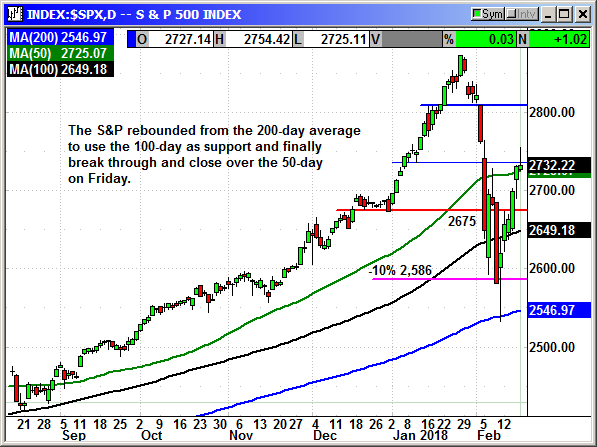 The S&P rebounded sharply for the week to close over the 50-day average on both Thursday and Friday. Earlier in the week, the index used the 100-day average as support. If we were to see another decline the 2,675 level should be initial support followed by the 100-day at 2,650. The Dow gained 1,025 points for the week and also closed over the 50-day average for the last two days. 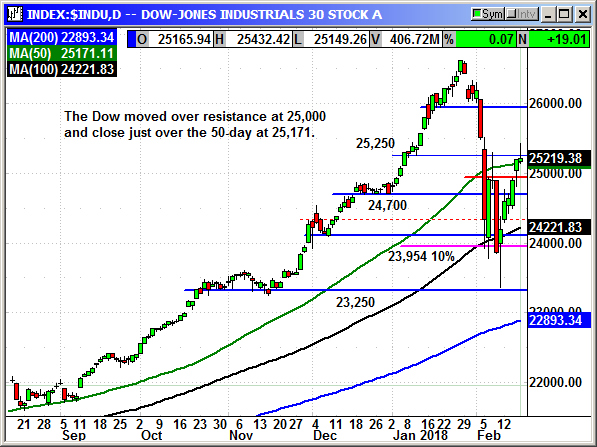 A retracement here should find support at 25,000 and then 24,700, which was support in December. There are two Dow components, HD and WMT that will report earnings before the open on Tuesday. These should influence market direction at the open. 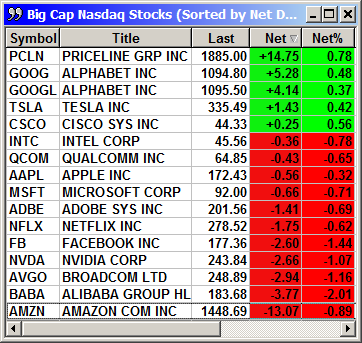 The Nasdaq was the market leader last week with a 365 point gain even after the 17 point decline on Friday. 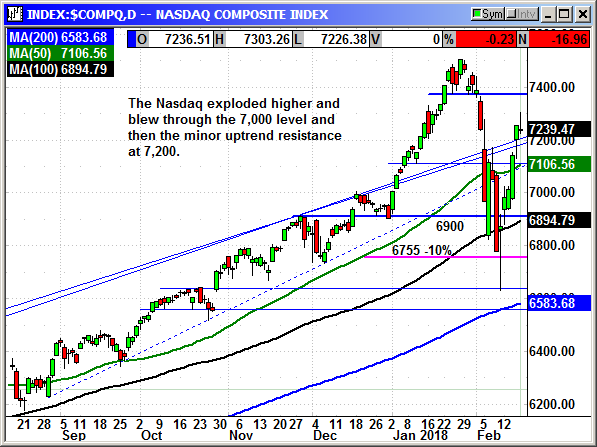 The Nasdaq blew through the 50-day at 7,100 to close well over the minor uptrend resistance at 7,200. The Nasdaq is only about 250 points away from its prior high. If we just had a decent week we could see those highs tested. Facebook was the laggard last week with declines early but a big rebound midweek only to decline again on Thr/Fri. 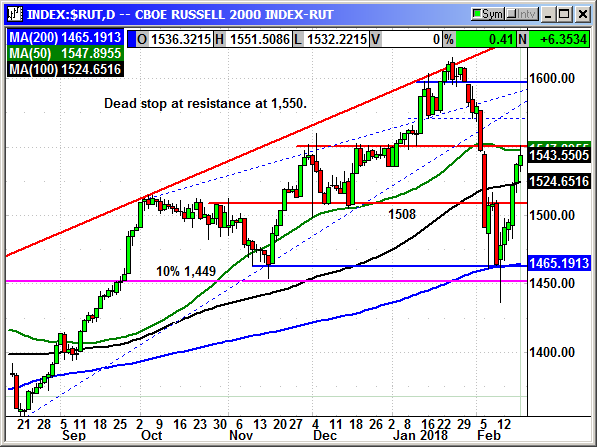 The Russell 2000 had a good week but came to a dead stop at prior resistance at 1,550. The index has rebounded 7% from its intraday low on Feb 9th, which is amazing. If the small caps could maintain their gains, they could lead the broader market higher. The earnings cycle is winding down and there will only be about 50 S&P components left to report after this week. Those will be spread out over the next three weeks so a very light calendar. This is the last major week. 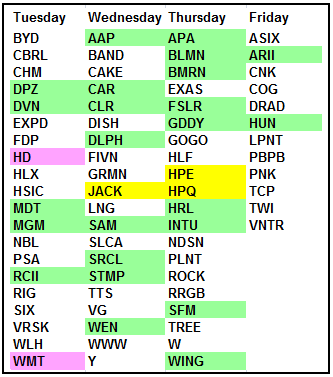 HD and WMT at the open on Tuesday and then the Hewlett Packard twins on Thursday. 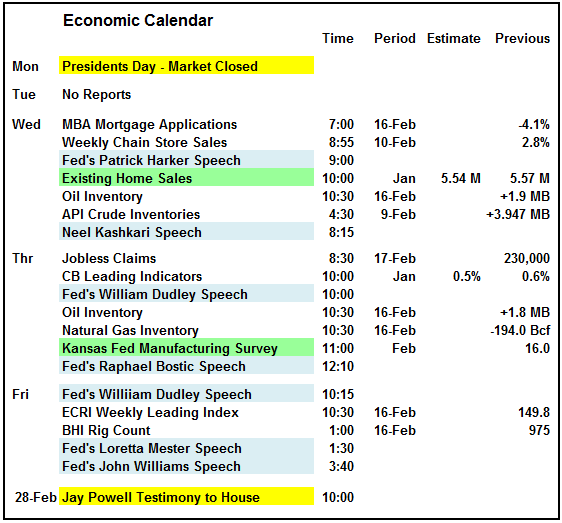 The economic calendar is also very light. The two reports in green are not market movers unless they miss estimates by a mile. The big threat is the Powell testimony the following Wednesday. That is Powell's first public appearance since he became Fed chairman. He could rock the boat but I doubt he will do it on purpose. There will be stress in his first testimony to the House committee and that could produce some verbal errors. The markets are due for another rest. The Dow and S&P have been up for six consecutive days. We need a pause to take the overbought pressures out of the markets again. The option premiums are rocketing higher again for the long dated options on popular stocks. We need some uncertainty and a triple digit decline on the Dow to force a reset. Then we should be good to go to retest the highs. That could still take a couple more weeks but the strong 16% earnings for Q4 and the forecast for 18% earnings growth in Q1 should be enough to keep the markets moving higher. Any material decline will be a buying opportunity. 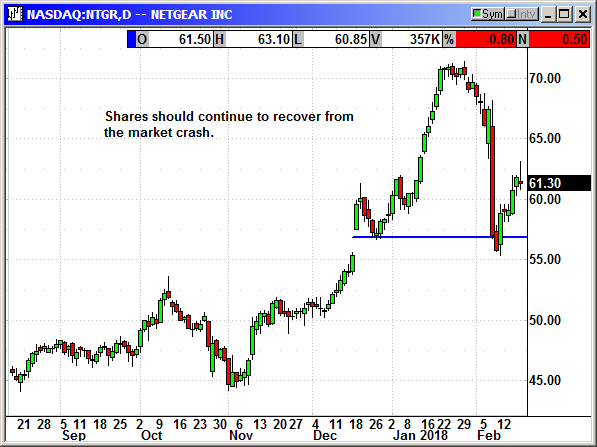 INGR was hammered in early February when they missed earnings by a penny just as the market began to crash. Ingredion posted record Q4 earnings of $1.73 that missed estimates by a penny. This was just at the start of the market correction and the shares were hammered in a down market. Revenue was $1.44 billion. For the year they guided for earnings of $8.10-$8.50, up from $7.06 in 2017. They ended the year with $2.4 billion in cash and short term investments. They recently acquired the Sun Flour rice business, TIC Gums and Shandong Huanong Specialty Corn, which positioned them for continued growth in 2018. Their high margin business portfolio saw a 28% increase in sales in 2017. While North America, Asia Pacific and EMEA all saw record revenues, South America was a drag as they completed a competitive restructuring in that region. For Q4 their reported and adjusted tax rates were 44.9% and 32.5% respectively. They took charges of $23 and $31 million related to the tax reform but will benefit greatly from the reduced taxes in 2018. 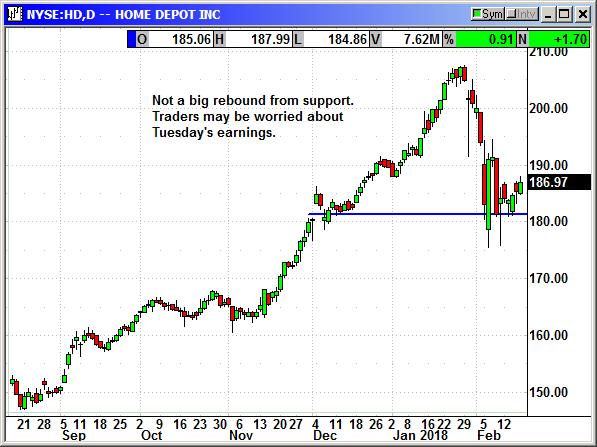 The decline knocked them down to long-term support at $127. I am recommending a shorter term option to capture a potential rebound when the market makes a new leg higher. 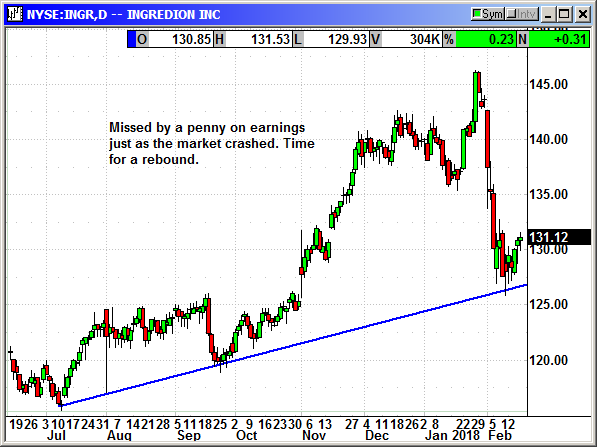 Ingredion did not rebound that much last week so they could be seen as a value play in the weeks ahead. Investors will be shying away from stocks with big gains and looking for stocks that were missed in the confusion. Buy April $135 call, currently $2.70, initial stop loss $125.75. The short stock position was entered on Tuesday. 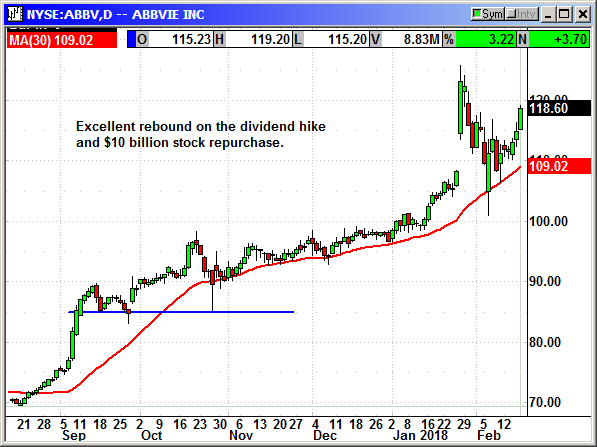 AbbVie raised its dividend by 35% to 96 cents and announced a $10 billion stock buyback program. This lifted the stock from Monday's low of $110.65 to $118.58 at Friday's close. HD reports earnings before the open on Tuesday. I feel strongly about HD's potential and the correction did not change their earnings picture. If they post a big beat, the stock could return to the pre correction levels. There is also the potential for them to significantly raise the dividend and increase their stock buybacks. Netgear added an outdoor satellite extender to the popular Orbi home wireless routers. The device is waterproof and adds 2,500 sqft hotspot of high speed WiFi coverage. Now all your friends can remain glued to their phones at the next barbecue. Shares rebounded all week until the Nasdaq faded slightly on Friday. Volatility has declined significantly but it is not over. It normally takes 4-5 weeks for volatility to return to normal after a high volatility event. The recent volatility 110% spike in the VXX is a once in a decade event. Without a nuke going off somewhere in the US, the odds are very remote of seeing the ETF over $50 again this year.